Imagine this scenario--you planned to serve beef steak for your guests. They arrive for dinner, but you realized you hadn’t thawed the meat yet. Now how can you cut frozen meat in the quickest time possible, so that you can serve dinner to your starving guests? I guess it’s safe to assume that we have all experienced this scenario before. Cutting frozen meat may sound difficult, but it can be done easily as long as you have a few tricks up your sleeve. 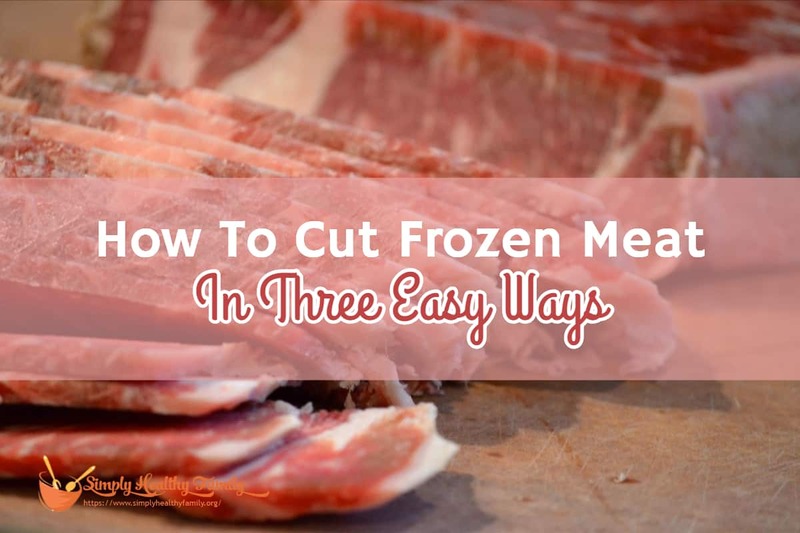 In this post, I will share some of those tricks that you can do to cut frozen meat. 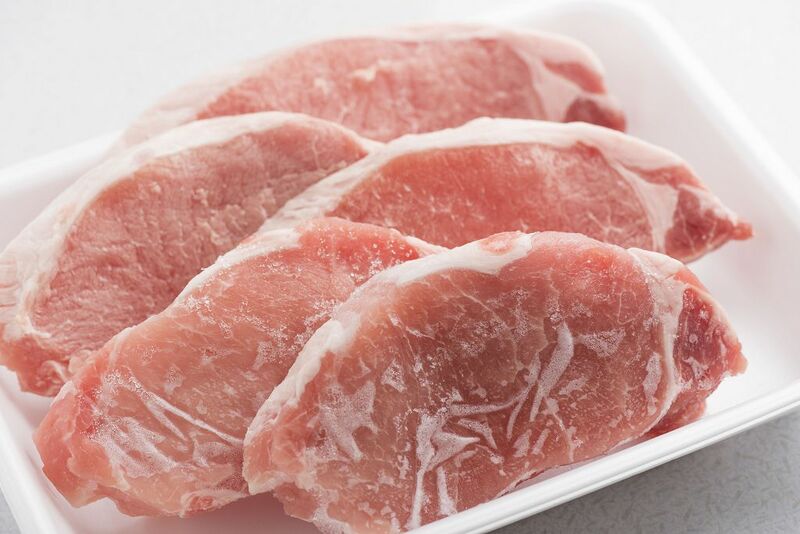 One way to cut frozen meat is to place it under running water for several minutes. Doing so will make it soft around the edges so that you will have an easier time cutting it even with the use of a knife. Believe me--- trying to cut frozen meat straight out of the freezer with a simple knife is difficult. The blade of the knife will just simply glance off the meat and potentially hurt you. Now after running the meat under water for several minutes, get a heavy duty knife that can do most of the work for you. Look for one with a jagged edge that can bite right in; or something like a meat cleaver that you can whack through stuff with. Then cut the meat using the heavy duty knife. If you’re to cut frozen sausage for bread boats stuffed with sausage recipe, then simply slice the sausage into chunks. A cleaver can particularly be handy as you simply whack it through the frozen sausage. You might also want to invest in knives like this. Frozen food knives have serrated edges that can easily cut through frozen foods. 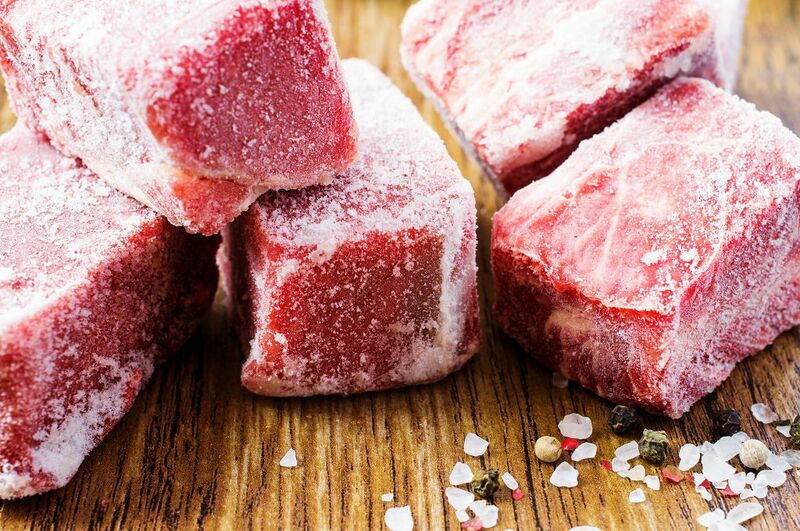 Here’s another way to cut frozen meat in the shortest time possible. By following this trick, you will be able to thaw frozen steak after a few minutes so that the meat will be easier to cut. First, remove the steak from the freezer. Make sure that the steak is wrapped in at least one layer of covering like a vacuum-sealed, ziplock-bag. This would prevent the juice of the meat from getting lost as you thaw it. Get a metal pot and add water. Don’t fill the pot with water; just put enough water to make it heavy. Use room temperature water because using hot water will cook the meat and cold water will just slow down the process. Place the steak on a baking sheet then put the pot with water on top of the steak. Thus, the frozen meat will be sandwiched by the baking sheet and the pot with water. After a few minutes, the meat will be perfectly thawed. In my experience, a thin cut of beet will take just 5 minutes to thaw if you follow this trick. 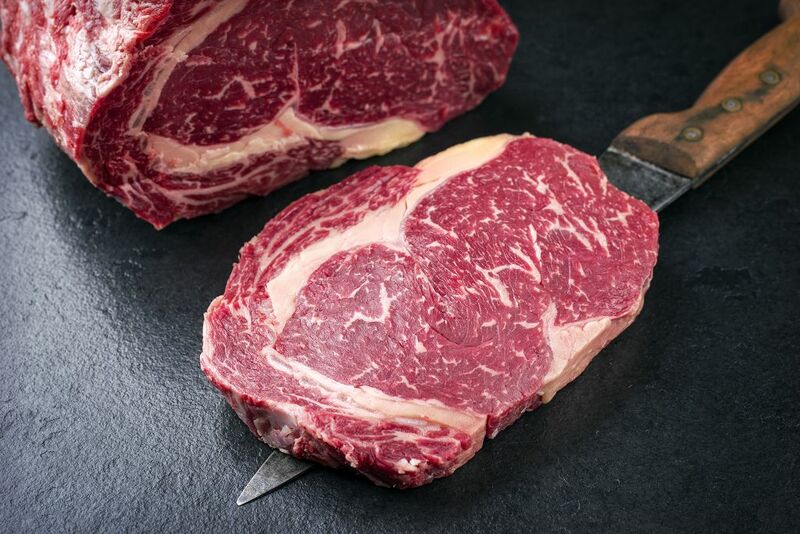 A thicker cut such as rib eye should take about 15 minutes. With the meat thawed, it will be a lot easier for you to slice it regardless of the type of knife that you are using. In cutting the just-thawed meat, make sure that the knife is away from you. Hold the meat in a place where it won’t slip, like a cutting board. This is another fast way to thaw the frozen meat so that it will be easy for you to cut it. This method would take about 5 to 10 minutes to thaw the frozen meat. 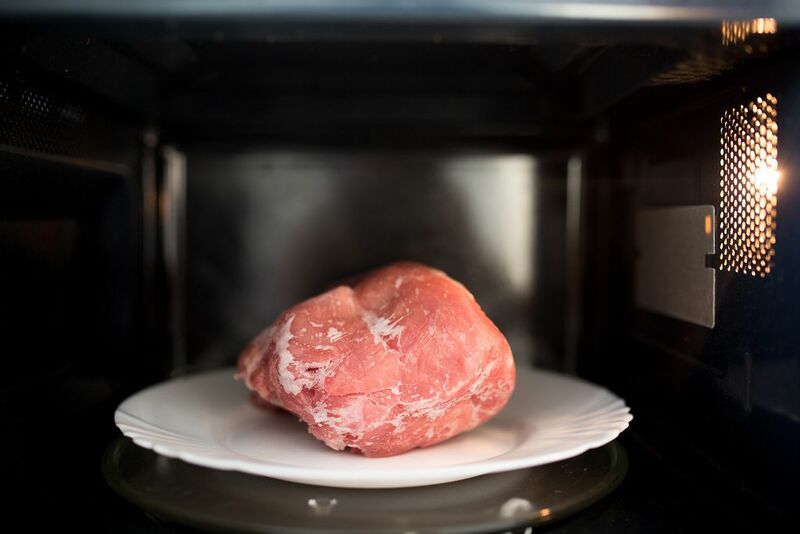 Simply put the frozen meat in the center of the microwave oven then switch on the defrost setting. But you have to be attentive because the meat could get semi-cooked if you leave it in the microwave for a longer time. Once the meat has been thawed, you can cut it according to what is called for in the recipe that you are following. Again, use a strong and sturdy knife in cutting the meat. Use a cutting board, too, so that the meat won’t slip when you cut it. Don’t get me wrong— placing the frozen meat in the refrigerator overnight or for a few hours is still the best way to thaw frozen meat. Refrigerating frozen meat gives it enough time to re-absorb ice crystals formed between fibers, which gives the meat better texture to cook. But by doing the two tricks that I discussed above, you will be able to thaw frozen meat quickly so that you will be able to cut them easily. Cutting frozen meat isn’t that difficult. You can thaw the frozen food quickly by microwaving it or running it under water. Or you can follow the metal pot trick that I shared with you. Of course, thawing the meat is just half the battle, so to speak. You need to have heavy duty knife to quickly cut frozen meat. I suggest you invest in a frozen food knife, too, as it can make the work done faster.